HAWAIIAN SHIRT Olive Navy Blue Purple PALM TREE ISLAND PARADISE Print ALOHA Men's Size M NEW! 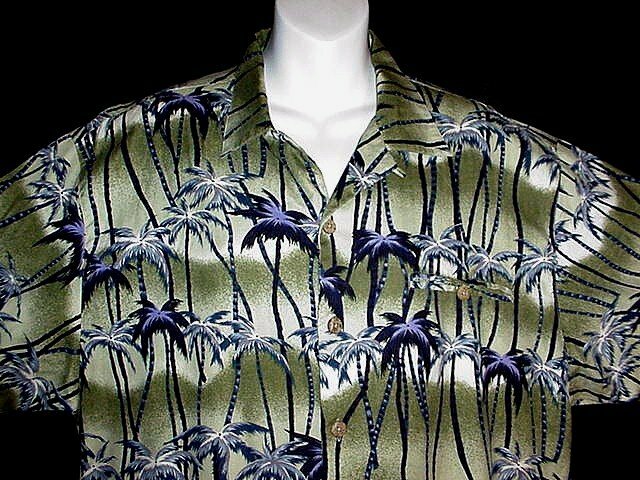 HAWAIIAN SHIRT Classic Olive, Navy Blue, Purple -= PALM TREE ISLAND PARADISE =- Print ALOHA Men's Size M NEW! This one will look awesome with a cream or white color tank to show off those rich colors in the shirt and either cream/white shorts or blue Levi 501s! A Classic Hawaiian Aloha Shirt Designed by ISLAND PARADISE, Top Stitched Seams, Collared Neckline with a Button and Loop Closure, Wide Square Cut Sleeves and Body, Covered in a Classic Tropical Print of an Orchard of Palm Trees in Blues from Navy to Lighter Shades with Purple Highlights, all on alternating Shades of Olive Green and Cream in the Background... Gorgeous! Shirt: Shoulder seam to Shoulder seam across is 20 1/2 inches, Underarm to Underarm/Chest 48 inches around, Waist 48 inches around and Overall Length is 31 inches from the top center back neckline to the hemline! **Condition** In Excellent condition, Hang Tag, Plastic Tab is Still Attached with no visible flaws at all to report! At Threads and Gurlz Gone Glam Lingerie Credit Cards are gladly accepted through our Direct Checkout, Cashier's checks and Money orders are gladly accepted as well! Thanks so much! HAWAIIAN SHIRT Classic Cruise BEACH COAST VACATION SCENE Print Men's Size S NEW w/TAGS! STUNNING PINK SATIN BROCADE 60's Set VINTAGE JACKIE O Suit WIGGLE DRESS w/COAT JACKET Mad Men 2/4-S! HAWAIIAN SHIRT Hawaii Traditionals Designer REYN SPOONER Floral GRAY BLUE PURPLE Men's Size L!